GTD—or “Getting things done”—is a framework for organizing and tracking your tasks and projects. Its aim is a bit higher than just “getting things done”, though. (It should have been called “Getting things done in a much better way than just letting things happen, which often turns out not to be very cool at all”.) Its aim is to make you have 100% trust in a system for collecting tasks, ideas, and projects—both vague things like “invent greatest thing ever” and concrete things like “call Ada 25 August to discuss cheesecake recipe”. Everything! Sound like all other run-of-the-mill to-do list systems, you say? Well in many ways it is, but there is more to it, and it’s really simple. Promise! So please read on. One of the basic assumptions of GTD is that you are dumb—or, rather, that your subconsciousness is quite dumb when it comes to thinking about things you should have done. For example knowing you need to fix your bike before next week, but instead of reminding you when you actually drive by the bicycle shop, it implants an incessant feeling of “I need to remember… something” in your brain. Pretend your brain is a white board. Is it covered with to-do lists and “DO NOT ERASE”? Is there space for drawing and combining ideas? A great part of the “magic” is to convert both tasks and whims into physical and visible actions as you soon will see. What GTD gives you—when understood and implemented properly—is a foolproof system for keeping track of what you need to do, should do, or should consider to do. When your system and your trust in your system is in place, your subconsciousness will stop keeping track of all the things you need to do and stop constantly reminding you. This reduces stress and frees up precious brain time to more productive thinking—maybe it even saves real time so that you have more time for ballet lessons, painting classes, and roller-blading. Awesome! So how does it actually work? It works by using special yoga techniques and daily mental exercises. No, haha! Just kidding. It works by simply maintaining lists, which every kid with paper and a pencil can do. Even computers can maintain lists these days! These lists will be reviewed regularly and form the backbone of the GTD system. Their workings are described below. In addition to the lists you will need a calendar which lets you write down date and time sensitive tasks and events. The in list is where you capture ideas and tasks as they occur to you. This can be your boss telling you to bake her a carrot cake, or seeing a poster for a circus you want to see. The barrier for adding something to your in list should be as low as possible—jot it down in a notebook or press the right buttons on your smartphone. While I have called it the in list, It is no problem to have more than one. Maybe a computer program for when you are in front of a computer and a notebook for when you loiter outside the mall? The important thing is that you are able to write down things as they occur to you. We want to offload work from the brain, remember? When you first start to use GTD you should take an hour to write down all things you want to—or have to—do. These so-called open loops include all things that aren’t as they should be, where they should be, and so on. Do you need to replace your toothbrush? Return the tea cup you borrowed from your aunt? Should you repaint your bed in another colour? All these things should go on your in list. If you have just started to use GTD and collected tonnes of items in your in list during the initial “brain-emptying”, processing can take a while. From now on the in list will be processed continuously. Now, if the item you’re currently processing is actionable—in other words: something should be done about it—you should ask the question “what is the next action?” The next action needs to be a physical and visible action. In other words, not “plan cake lottery”, but “e-mail Arthur and Camille and remind them to bake their cakes”. This very thing—that a next action should be the next physical, visible action to move the project closer to its goal—is perhaps the most important “rule” in GTD. By using a few extra seconds to come up with what physically needs to be done, you make sure that your “next action” lists will only contain the things you can choose to do at any moment. The “pre-processing” has already been done (the actions themselves may very well be planning tasks, though) and this greatly lowers the resistance to do the things. When you have determined the next action, you should consider if it takes less than two minutes to do it. If this is the case: do it. Right away. (Things like “e-mail funny cat video to grandma”.) The reason for this is simple: if the action takes two minutes or less, the overhead of tracking it will be large compared to how long it takes to just do it. If it takes more than two minutes you should delegate it if appropriate—noting what was delegated, and when—on a waiting for list, or add it to your own next actions list of things you want to do as soon as you have the time. Unless your secret superpower is delegation, next actions is probably where most things will end up. If the open loop will take more than one action to close, the overall goal should also be noted on a projects list which will be explained in a few sections. The GTD work flow: open loops are collected in the in list, processed, and if it’s an action it’s done immediately, deferred, or delegated. If the item being processed require more than one action it’s recorded in the projects list as well. So what’s the next actions list? Well, uh… a list of your next actions, obviously. Another name for these actions is “as-soon-as-possible actions”—it is simply those things from which you will pick out what to work on when you are not watching funny cat videos on Youtube or playing Candy Crush Saga. When you delegate work to others, send an e-mail you expect (or need) a reply to, order something, or have a task that is “blocked” because you are waiting for someone else to do something, it should be written down on your waiting for list. These items should always be marked with the current date so that you’ll be able to e-mail your co-worker Marvin and say “I’m still waiting for the WTF report you said you’d finish within a month. That was 32 days ago!”. If you’re still with me you might have worried that a “research artificial intelligence textbooks” action on your next actions list is all that is written down about your plan to take over the world. Wouldn’t it be easy to lose track once that action is done and erased from your list? Yes, it kinda would. That’s where the projects list comes in. GTD’s definition of a project is very broad. It defines any objective that requires more than one action as a project. These projects should go on your projects list. This list is simply a list of project titles and—if you like—descriptions and intended outcomes of the projects. When reviewing the projects list, you will make sure that there is always at least one action on your next actions list for each project, thus making sure that your projects aren’t forgotten. It is common to prefix contexts with an ‘@’ which makes sense when the context is a location, but should just be thought of as a notation in other cases. Examples of contexts are @ home, @ computer, and @ office. How many contexts you need depend on how many next actions you will have and how your work day looks like. The important thing is to be able to assess—at a glance—what your possible actions are depending on where you physically are and what equipment you have available. It can also be a good idea to make an “everywhere” context for things you can do no matter where you are (“Call mum and get goulash recipe”). If you have regular meetings with people, it can be beneficial to have “agenda contexts”—one for each person—where you note down the things you want to talk about during the next meeting as you think of them. For example, if you have a weekly meeting with Foobert, you might consider having a “@ Foobert Agenda” context. These contexts will of course change as your team/managers/supervisors, etc. change. This is where the some day/maybe list comes it. This list simply contains ideas and projects you might want to realize at some time in the future. This is where both “replace ugly painting in bedroom” and “start a cult” should go. (Assuming—of course—that you don’t want to do either of those things right now.) This list should be reviewed weekly along with the rest of the system as described in the section on the weekly review below. The calendar is for things you have to do on a certain date or at a certain time—and nothing else! That’s right; no putting “install Bonzibudddy” on your calendar for next Wednesday if you just think you want to have it done then. By only having items that really are time and date sensitive on your calendar it will be more useful, since it will actually tell you the things you have to do a certain day without being “diluted” with other items. The thing you want to do, but that doesn’t need to be done at a certain time will be on your next actions list anyway, so you will be reminded about it and have the chance to do it. David Allen’s book on “GTD” calls the weekly review a “critical factor for success” and he is not joking. If you start using the GTD framework and you are not a robot, things will start to slip. You will complete the next action of a project and forget to add a new “next action” for that project. You will forget to remove next actions that you—if you really thought about it—know that you won’t do in the near future because more important things have shown up, and so on. Look through your someday/maybe list and see if some projects/actions should be moved to the list of current projects/the next actions list. If creating a new project on your projects list, make sure to figure out its next physical, visible action and put it on the next actions list as well. When working through your trigger list, put anything that you remember in your in list to be processed afterwards. An example of a trigger list can be seen at Lifehacker’s trigger list for students. You probably want to customize your own list as you get more experience and learn what works best for you. To actually get your GTD system to work there are some important “best practices” you are advised to follow. As you start getting comfortable with using GTD you can be a bit more lenient if you believe that it would be better. It is important that you have hard edges between your lists, and between your next actions lists. If you often find yourself wondering which context a next action belongs to you might want to reconsider your contexts. Your tools should be fun to use—but not too fun! If you have a slow and complicated tool for managing your lists you will subconsciously resist collecting small tasks, and if your tool is too fun to use you will end up over-using it and spend time playing with its amazing features. Find something that works for you. The read/review folder and tickler file are two tools which—while they aren’t directly part of the GTD method—may be beneficial to use together with GTD. You will probably have quite a few “read [some document]” actions on your next actions list. A read/review folder is simply a physical folder you carry around, containing the papers, documents, and anything else you want to read. The idea is to have this material available whenever you have a few minutes to kill. In the dentist’s waiting room? Waiting for your food at a café? Both perfect opportunities to peruse the paper on Periophthalmus modestus phylogeny or pretend to read the memo from your boss! It is really important to have “sharp edges” here, too. Only the things you actually want to read when you have the time should be put in this folder so that you actually will pick it up during those little windows of free time that show up during the day. This strangely-named concept is simply a collection of 43 file folders. Why 43? Because that means that you can have one for each of the 31 days of a month plus one for each of the 12 months of the year. If you’re reaching for your calculator now—just trust me on the number 43. So what are these folders used for? The idea is that you can place physical items you will need on a specific day (tickets for the concert), reminders of things you possibly want do on a specific date (remember, the calendar is only for things that have to be done on a specific date/time), or the notes from the lecture you didn’t really understand (“I will want to review these in a week when my subconsciousness has chewed on it for a while”). Every day when you get up, you open the folder with the current date. You then pocket your concert tickets, decide that you do want to take the dog to the dog hairdresser today, but push the lecture notes back three days since you don’t have time right now. Having emptied the folder, you place it in the back, bringing tomorrow’s folder to the front. At the end of each month, you open the folder for the new month and deal with its contents—like putting items in the correct day folders. The tickler file thus provides a way to send yourself reminders in the future—tickling your memory. A-ha! This guide was written to serve as a simple, pragmatic guide to the “getting things done” method. 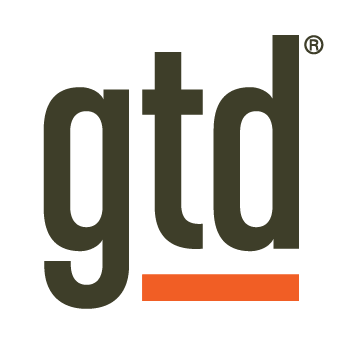 This run-through of the GTD method is meant to be brief. It’s written from one person’s perspective and other people would probably assess the importance of different aspects of GTD differently. If you want a complete overview of GTD you would be wise to read David Allen’s book which formalized the method he developed: “Getting Things Done: The Art of Stress-Free Productivity” (Amazon , Kindle Store , Bookdepository, Google Books, Wikipedia). The guide’s visual style was inspired by Miran Lipovača’s excellent guide to the Haskell programming language “Learn You a Haskell for Great Good!”.